TODA Racing utilizes the latest design and manufacturing technologies to develop FIGHTEX coilover systems. FIGHTEX coilover systems should not be confused with cheaper height adjustable systems. The FIGHTEX system is complete and specifically tuned for every vehicle application. 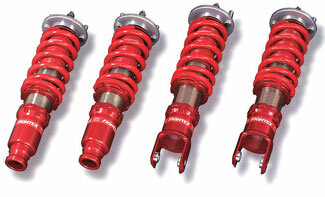 TODA Racing suspension systems are among with worlds highest quality and highest performing coil-overs systems. All development and manufacturing is done in house by TODA Racing.